Editor's note: We are reposting this VoxEU column, which was originally published in August 2017, in celebration of William Nordhaus's Nobel Prize. In my previous column, I examined the Trump Doctrine on trade and some of its key fallacies, along with the allure of the Auerbach-Ryan plan on business tax reform. In this column, I provide a further analysis of the economics of trade, including the potential losers and the broader role of trade policy in international cooperation. The modern theory of the trade balance, described here, will help explain why President Trump’s focus on the trade balance is so misguided. International economic history exhibits a fundamental divide in 1973. Before 1973, the major economies of the world had fixed exchange rates. The gold or silver standards, used by the US from the time of the first US treasury secretary, Alexander Hamilton, until 1935, was such a system. After World War II, nations were on a dollar standard. In 1970 about 95% of world GDP was produced by countries operating with fixed exchange rates. In 1973, the US and most other countries abandoned gold and fixed exchange rates. By 1975, more than 80% of the world’s GDP was produced by countries operating with flexible exchange rates. The era of flexible exchange rates had arrived. A parallel trend has been the opening, or globalisation, of financial markets. Aside from China, virtually all countries today are open to financial inflows and outflows. Once countries operate with flexible exchange rates and open financial markets, the trade balance marches to a different drum. US trade deficits (or more correctly, the current account balance, which includes services and transfers) are the accounting counterpart of low US national saving and high foreign saving. Economists believe, indeed, that the causality runs from national saving to trade. In other words, because the US has such a low domestic savings rate, US investment in research, equipment, and structures is partly funded by foreign saving. This foreign saving is registered as a balance of payments surplus, which is the exact counterpart of the deficit on trade and service account. To put this in a homey way, we can say that the tail of finance wags the dog of trade. 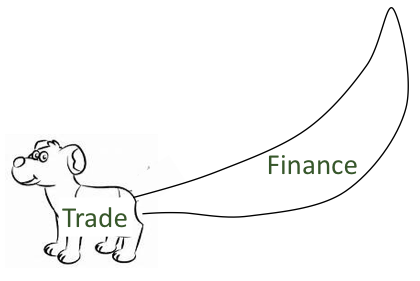 The dog of trade looms larger in terms of employment and output, but we must look at the tail to understand the movements in the dog. 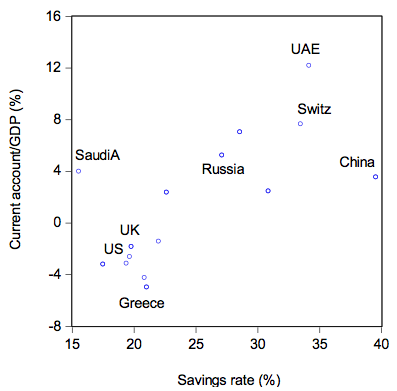 To illustrate, the US is a low-saving country, and China is a high-saving country. Over the last quarter-century, China saved 44% of its national income, while the US saved 18%. The result was that China put its excess saving abroad through its trade surpluses, while the US did the opposite. More precisely, China ran a current account surplus amounting to 4% of income, while the US ran a deficit of 3% of national income. Other high-saving countries with trade surpluses were Japan, Hong Kong, and Germany, while low-saving countries with trade deficits included Mexico, South Africa, and the UK. Figure 1 shows a more systematic picture. This displays the national saving rate on the horizontal axis and the current account as a ratio of GDP on the vertical axis. For the current account ratio, a positive number is a surplus and a negative one is a deficit. We can see here that the US fits in nicely with the low saving countries. By contrast, oil producers, who have high savings rates, put their funds abroad and run surpluses. An interesting example of the way foreigners save in the US is the accumulation of dollar reserves by foreign central banks. These nest eggs (totalling $6 trillion owed by the US to foreign official agencies) are held by foreigners to protect against speculative attacks on their currencies. But the result of this accumulation of dollars by foreigners is that the exchange value of the dollar is higher and the US tends to run a larger trade deficit. Another source of financial flows into the US is a portfolio effect. Foreigners own about $10 trillion of US debt securities. Just for simplicity of exposition, suppose this is a constant 10% of foreign portfolios. If the portfolios are growing at 3% a year, then foreigners will need to buy $300 billion of US debt each year to maintain the 10% share. This would have to be offset by a trade deficit. Hence, the paradox is that the US trade deficit is big because its financial markets are so attractive, not because of lousy trade deals. Two hundred years ago, in the days of David Ricardo, it was largely true that goods were ‘made’ in one place. Such was standard during the ‘first wave of globalisation’, as has been described in the remarkable book on globalisation by Richard Baldwin (2016). Today, we have moved to the second wave. As with the iPhone or iPod described in my previous column, the production processes for cars, air conditioners, and airplanes have been sliced up very finely among different producers thanks to revolutionary declines in transport and communications costs. We live in the era of highly specialised global supply chains, which involve the increasingly intensive cross-border flows of goods, technology, investment, services, and workers. Take the example of the Boeing 787. This is assembled in the US. But the central fuselages are made in Italy, the landing gears in Japan, the wingtips in Korea, the batteries in Japan, the engines in the US and UK, the cargo doors in Sweden, the passenger doors in France, the trailing wing edges in Canada and Australia, and the rear fuselages in the US. The key role of Boeing is actually the research, design, and coordination. American ‘manufacturing’ today is largely conceptual, not manual. 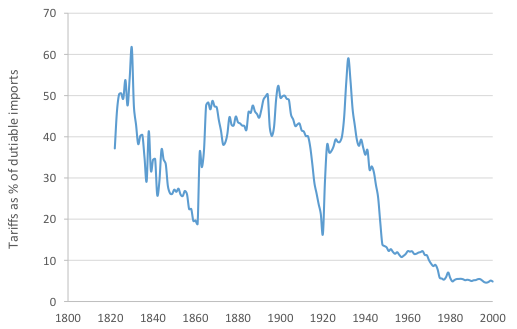 Take a step back to review the growth of international trade since World War II. According to the US Bureau of Economic Analysis, in 1945, total trade in goods and services (the sum of exports and imports) was 6% of US GDP. By 2016, total trade was 27% of GDP. This growth was paralleled in most other countries, and indeed other countries generally have larger trade openness than the US. What were the reasons behind this phenomenal growth? The first spurt came from the opening up of markets after the lifting of controls imposed during the Depression and World War II. This was accomplished through several rounds of international agreements lowering barriers to trade and finance along with the formation of the EU. The most recent trade expansion was driven by changes in communications and transport costs. Almost everyone appreciates the role of the internet, which permits costless information transfers and thereby allows home countries to coordinate and control the vast supply chains that make possible low-cost production. Containers represented an invention that was tailor-made for low-cost, high-volume international trade. The major beneficiary of the container revolution has been China. Whereas in 1990, China was barely on the container map, by 2014 six of the ten largest container ports were Chinese (or eight if we include Hong Kong and Singapore). In 2014, China’s major ports shipped 126 million containers. Containers did not just lower transportation costs; they allowed companies to reorganise their production processes. It would not be possible to ship all the different components of an iPhone around the world if they were taken on and off of ships and trucks and boxcars by hand, as in the earlier era of On the Waterfront. One study concluded that containerisation had an impact on a country’s trade flows that was four times as important as joining the WTO (Bernhofen et al. 2016). The structure of the global supply change has an important implication for Mr. Trump as he contemplates tearing up existing trade deals. Other countries are critical links in the value chain. Suppose he imposes a 45% tariff on China, as he has threatened (New York Times 2016). China might retaliate by slowing the assembly of iPhones and other American products. For want of a screw, the Apple kingdom would be lost. Similar concerns apply to every complex global production process. No country is an isolated and protected island in the great value chain. People are of two minds on trade. They love their inexpensive running shoes and smart phones, but they worry about the dislocations caused by trade. So consider the losses from trade, perceived and real. International trade improves the lot of the vast majority of Americans and others around the world, but some are economically harmed along the way. Not just by international trade, but also by domestic trade – by the impersonal market forces that create new products and jobs, but destroy old ones. Markets are cool-headed but cold-hearted. As Arthur Okun said in his book on inequality, we should award two cheers for the market but not three (Okun 1975). Begin with inequality. 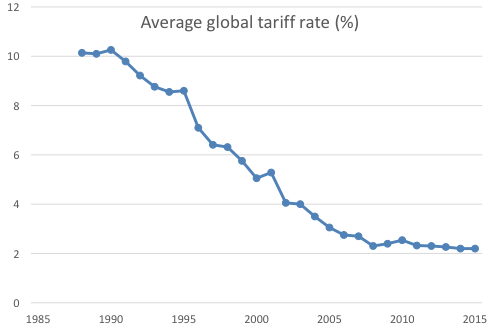 It seems likely that global inequality has been reduced by trade. The rapid growth in many low-income countries such as China and India has been spurred by export-led growth as well as technologies embodied in investments by cutting-edge companies from advanced countries. The growth in these large countries means that global inequality has been stable or declined slightly in recent years (Milanovic 2015). The sources of inequality in the US are more complicated. The rising inequality has been concentrated at the top. From 1980 to 2015, the share of the top 1% rose from 11% to 20%, while the share of the bottom 80% fell from 56% to 49% (Milanovic 2015). Scholars who have studied the reasons have found many sources. Studies point to forces such as the decline of labour unions, lower taxes on top earners, the labour-saving nature of technological change, the emergence of the superstar economy, immigration of low-skilled workers, the growing share of finance, as well as displacement of high-wage jobs in import-competing industries. While all these took place in the context of increased globalisation, it is hard to see trade imbalances as the major cause of rising inequality. While globalisation has probably had a small effect on domestic inequality, a more important concern is the impact on employment. There is no doubt that trade has affected the composition of jobs. The major domestic impact of trade was on manufacturing employment. According the Bureau of Economic Research, in the last three decades, employment in manufacturing declined from 16% to 9% of the US total. The largest percentage losses were in textiles, apparel, and printing. The reason is straightforward: foreign products have become relatively inexpensive, and domestic manufacturing output and employment have declined as a result. While changes in trade patterns have had large effects on manufacturing, according to the Job Openings and Labor Turnover Survey (JOLTS) by the US Bureau of Labor Statistics, the total number of jobs increased by 10% over the 1998-2015 period. The losses in manufacturing were more than offset by gains in professional, health, and educational services. Roughly a half-million manufacturing jobs were ‘lost’ to other industrial countries (outside of China and India), but over this period the US economy gained 16 million jobs. International trade shares an interesting asymmetry that is common to many intractable political problems, such as environmental policies. They tend to have widespread benefits but narrowly targeted and large losses. Virtually all of us benefit from the low prices and greater variety provided by international trade, but the job losses – in sectors like textiles and apparel, steel, and autos – are concentrated in a few sectors and communities. A humane society would devise policies to compensate the losers from income losses from trade and technological shocks, but such policies run afoul of market fundamentalism. Indeed, conservatives undermine their own causes when they fail to enact policies to soften the blows of the market system that they, the conservatives, so admire. A final flaw in Mr. Trump’s conception is to think that trade deals are a zero-sum game – that when Mexico hires a worker to produce air conditioners, this robs America of a job. Perhaps, the president learned this lesson in a lifetime of bidding on real-estate deals, where one side wins and the other side loses. Or in running casinos, where the little people are literally losers, but a bad deal can bankrupt even the smartest. In reality, international trade deals are completely different from casinos or real-estate transactions. Trade bargains are a game in which there are multiple outcomes. At one extreme, countries can fall into a harmful high-tariff, non-cooperative outcome, like the one envisioned in the prisoners’ dilemma, where each country pursues its own nationalistic self-interest. Or they can pursue a cooperative free-trade strategy, in which countries agree to self-restraint and allow international competition, specialisation, and the division of labour to lower costs and raise living standards. Returning to our example of the iPhone made around the world, we might ask, how did this happen? Why do we enjoy the free trade in electronic goods that produced the iPhone? What has provided us with the inexpensive running shoes, or the safer and less expensive cars? Today’s free and open trading system was not only a product of the market. It was equally the result of a near-century of difficult and complicated negotiations among countries. Historically, the US was a high-tariff country; For the period from 1820 to 1930, the average US tariff rate was almost 40% (Carter et al. 2006) The last major tariff-raising legislation was the Smoot-Hawley Tariff of 1930, at which point the average tariff rate peaked at 59%. Along with retaliation and military conflict, this led to serious disruptions to international trade in the Depression and beyond. Source: Carter et al. (2006), Table Ee430. Note: Averages of 64 countries representing 91% of world trade in 2010, weighted by 2010 shares of imports. The important point here is that an open trading system is a victory won by the peaceful armies of trade negotiators. Open borders plus containers plus the internet plus innovation are the engines that have produced the cornucopia that American and other consumers enjoy. This is the cooperative regime of game theory, which required tireless efforts to escape a non-cooperative regime of high tariffs. Mr. Trump’s administration has already torn up the latest negotiated pact, the Trans-Pacific Partnership, and in May 2017 formally notified Congress of its intent to renegotiate the North American Free Trade Agreement (NAFTA). It has launched protectionist measures in lumber (CNN Money 2017) and threatens ones on steel (Reuters 2017). Up to now, there have been no countermeasures, but European Commission President Jean-Claude Juncker warned, “We are prepared to take up arms if need be” (New York Times 2017). Presumably, he means a trade war, not a ground invasion. The threats to the international trading system illustrate the danger of Mr. Trump’s world view. “America first” is a non-cooperative ideology in which the US would pursue its narrow self-interest in trade, military policy, climate change, and nuclear policy. By pursuing the non-cooperative strategy, we forego the opportunities that can only be achieved when nations work together to solve global problems. Cooperation is not altruism in which “stupid” negotiators allow countries to exploit the US. Rather, it is the expression of farsighted self-interest that requires brains and grit and stamina. We have seen the results of a near-century of cooperation in international trade as well as in the declining deaths in war (Pinker 2011). The US and other nations should reject the economic nationalism of Mr. Trump et al. and continue on the path to open our borders to trade, reverse nuclear proliferation, and slow climate change. Market forces can work miracles, but they cannot overcome the problems of pollution and war and human-imposed barriers to trade. Baldwin, R (2016), The Great Convergence: information technology and the new globalization. Cambridge, MA: Harvard University Press. Bernhofen, D M, Z El-Sahli and R Kneller (2016), “Estimating the effects of the container revolution on world trade”, Journal of International Economics 98: 36-50. Carter, S B, S S Gartner, M R Haines, A L Olmstead, R Sutch and G Wright (2006), Historical Statistics of the United States: Millennial Edition, New York: Cambridge University Press. CNN Money (2017), “Trump slaps first tariffs on Canadian lumber”, 25 April. Levinson, M (2016), The box: How the shipping container made the world smaller and the world economy bigger. Princeton: Princeton University Press. Milanovic, B (2005), Worlds Apart: Measuring International and Global Inequality, Princeton: Princeton University Press. New York Times (2016), 'Donald Trump Says He Favors Big Tariffs on Chinese Exports', 7 January. Okun, A M (1975), Equality and Efficiency: The Big Tradeoff, Washington DC: The Bookings Institution. Pinker, S (2011), The Better Angels of Our Nature: Why Violence Has Declined, New York: Viking. Reuters (2017), 'Despite delay, U.S. expected to impose steel tariffs', 15 August.